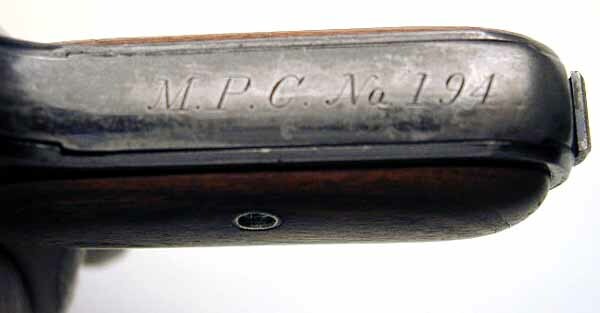 Model M .380 serial number 1869 factory inscribed "M.P.C. No. 112" on grip safety. 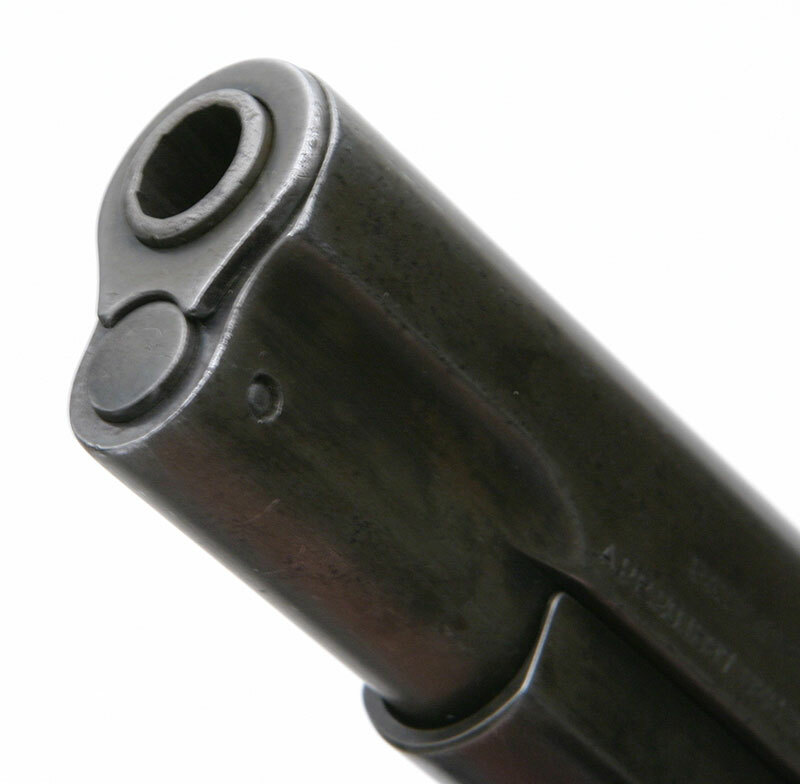 One of the earliest known police marked examples shipped on late 1908/early 1909 with barrel bushing. 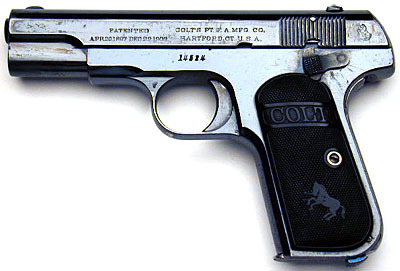 This police contract is the earliest contract on record at Colt for the .380 caliber Model M pistols. MPC is believed to be the Metropolitan Parks Commission (Boston PD). 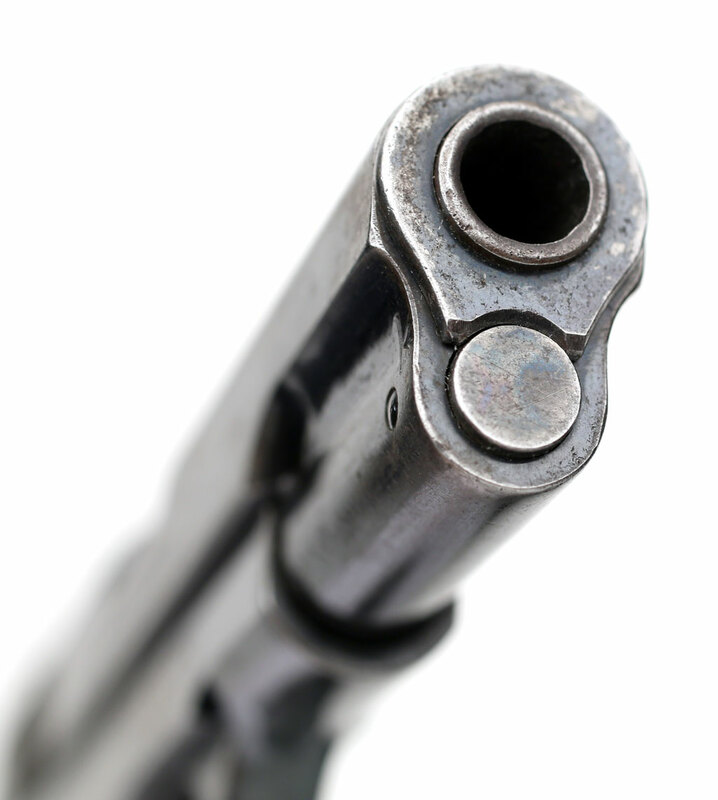 There were a total of 214 pistols sn 1328 - 14644 shipped 12/5/08 - 6/4/13. Model M .380 serial number 4406 factory inscribed "M.P.C. No. 161" on grip safety. 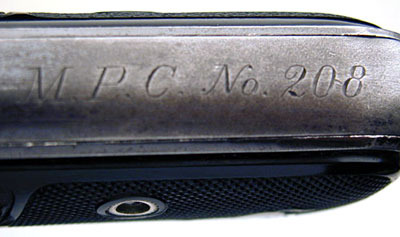 An early police marked example with separate barrel bushing and one of 17 shipped on December 7, 1909 to Iver Johnson Sporting Goods Company, Boston, Massachusetts. This police contract is the earliest contract on record at Colt for the .380 caliber Model M pistols. MPC is believed to be the Metropolitan Parks Commission (Boston PD). 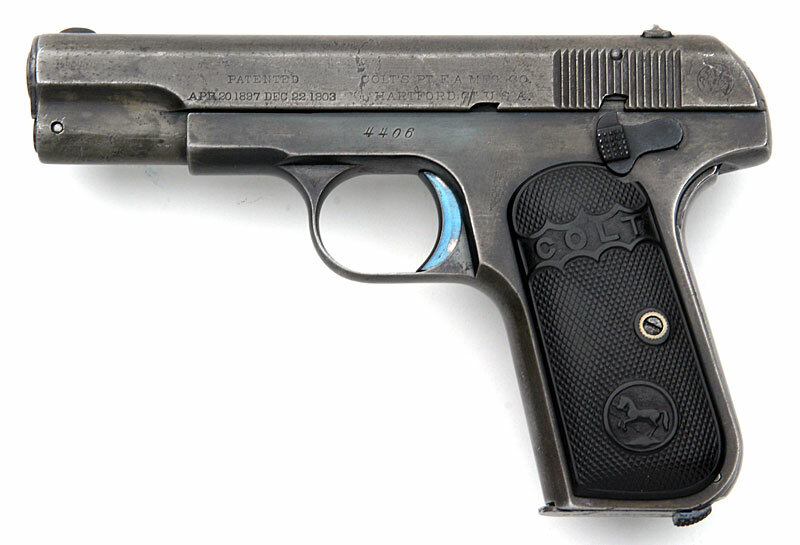 There were a total of 214 pistols sn 1328 - 14644 shipped 12/5/08 - 6/4/13. Model M .380 serial number 5635 factory inscribed "M.P.C. No. 173" on grip safety. One of the earliest known police marked examples shipped in late 1908/early 1909 with barrel bushing. 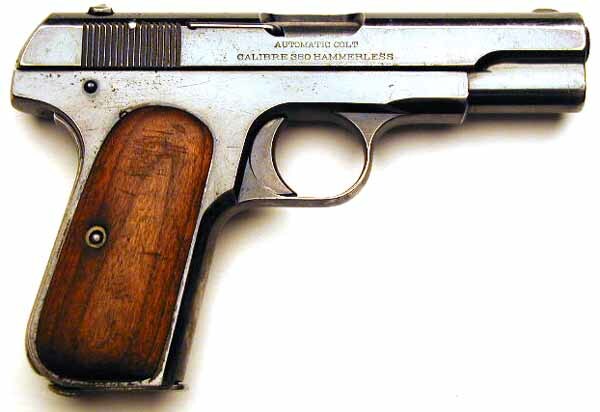 This police contract is the earliest contract on record at Colt for the .380 caliber Model M pistols. MPC is believed to be the Metropolitan Parks Commission (Boston PD). There were a total of 214 pistols sn 1328 - 14644 shipped 12/5/08 - 6/4/13. Model M .380 serial number 5635 factory inscribed "M.P.C. No. 173" on grip safety. 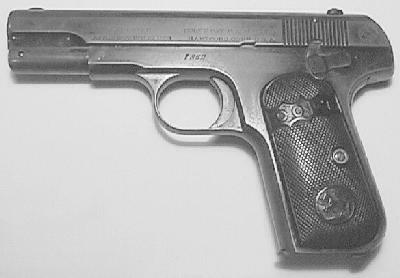 "K" mark on the upper right flat of trigger guard indicates that this pistol was returned to the factory for work. Model M .380 serial number 5890 factory inscribed "M.P.C. No. 174" on grip safety. One of the earliest known police marked examples shipped in late 1908/early 1909 with barrel bushing. 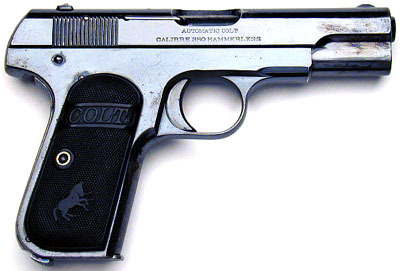 This police contract is the earliest contract on record at Colt for the .380 caliber Model M pistols. MPC is believed to be the Metropolitan Parks Commission (Boston PD). There were a total of 214 pistols sn 1328 - 14644 shipped 12/5/08 - 6/4/13. 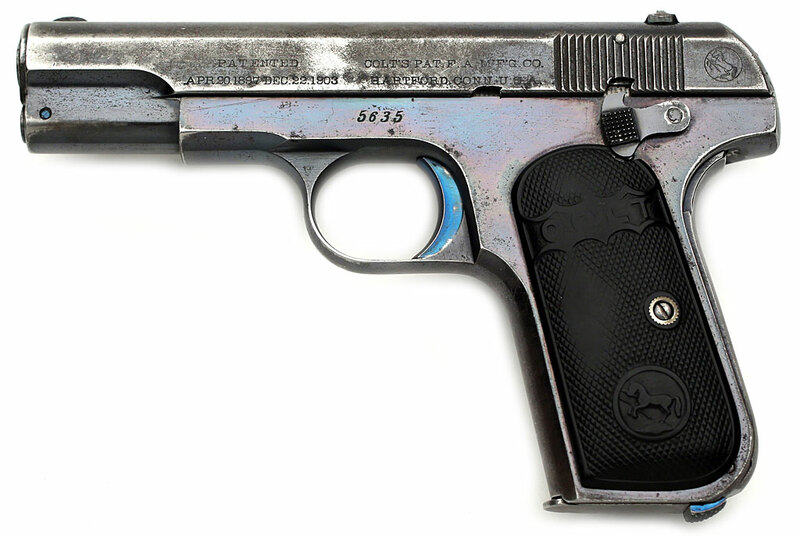 Model M .380 serial number 5890 factory inscribed "M.P.C. No. 174" on grip safety. Model M .380 serial number 14568 factory inscribed "M.P.C. No. 194" on grip safety. 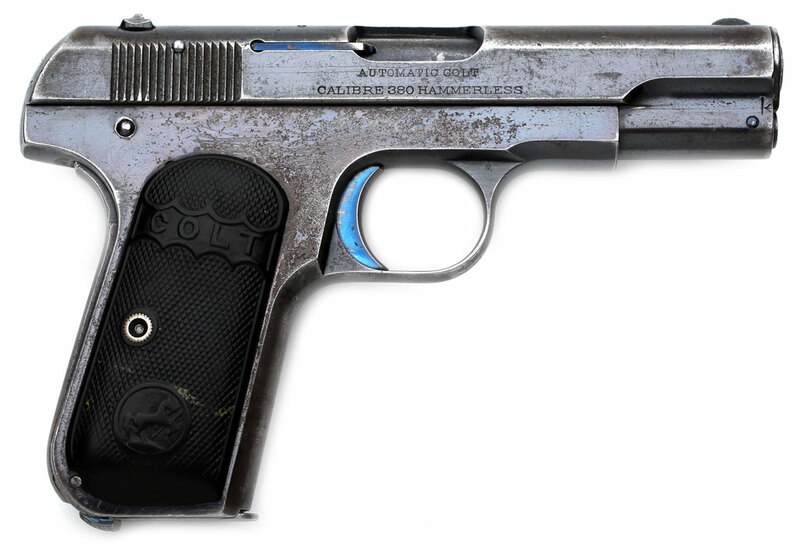 One of 15 pistols shipped to William Reed & Sons, Boston, MA on May 28, 1913. 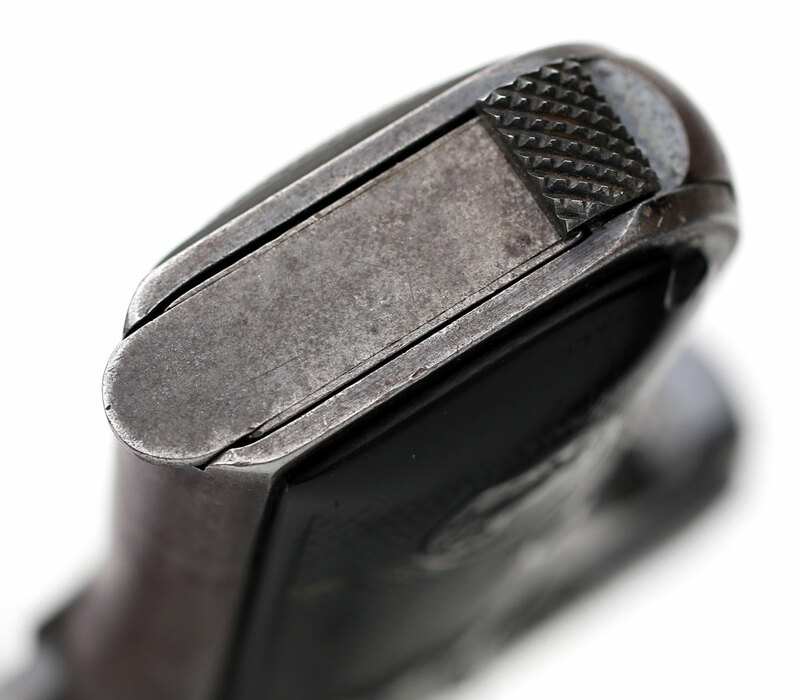 An example from near the end of the contract run with integrated barrel bushing Grips have been replaced with smooth walnut type. 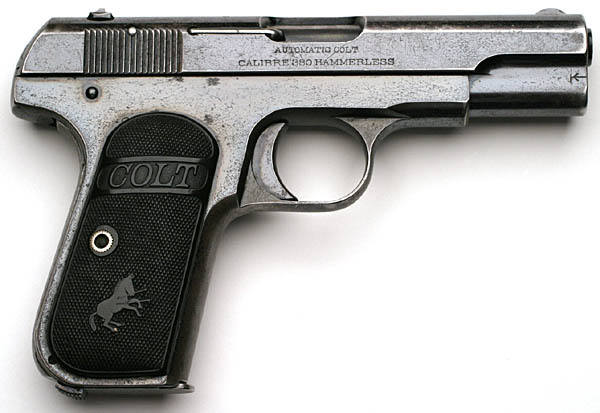 This police contract is the earliest contract on record at Colt for the .380 caliber Model M pistols. MPC is believed to be the Metropolitan Parks Commission (Boston PD). 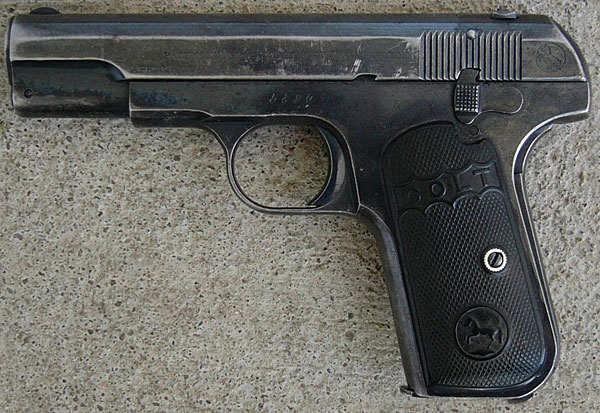 There were a total of 214 pistols sn 1328 - 14644 shipped 12/5/08 - 6/4/13. Model M .380 serial number 14568 factory inscribed "M.P.C. No. 194" on grip safety. Model M .380 serial number 14568 factory inscribed "M.P.C. No. 194" right side. Model M .380 serial number 14524 factory inscribed "M.P.C. No. 208" on grip safety. 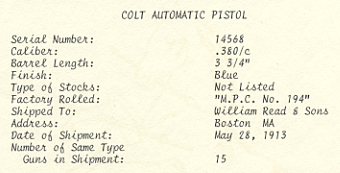 An example from near the end of the contract run with integrated barrel bushing This police contract is the earliest contract on record at Colt for the .380 caliber Model M pistols. MPC is believed to be the Metropolitan Parks Commission (Boston PD). There were a total of 214 pistols sn 1328 - 14644 shipped 12/5/08 - 6/4/13. Model M .380 serial number 14524 factory inscribed "M.P.C. No. 208" on grip safety. 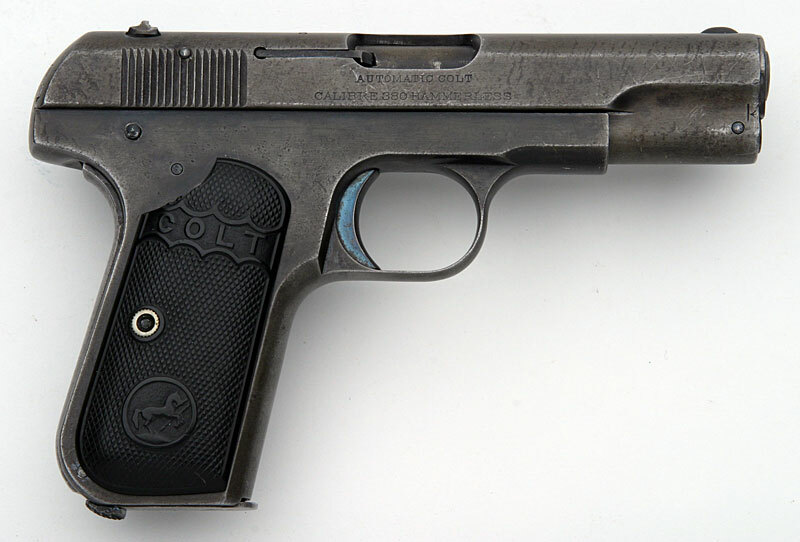 Model M .380 serial number 14578 factory inscribed "M.P.C. No. 214" on grip safety. 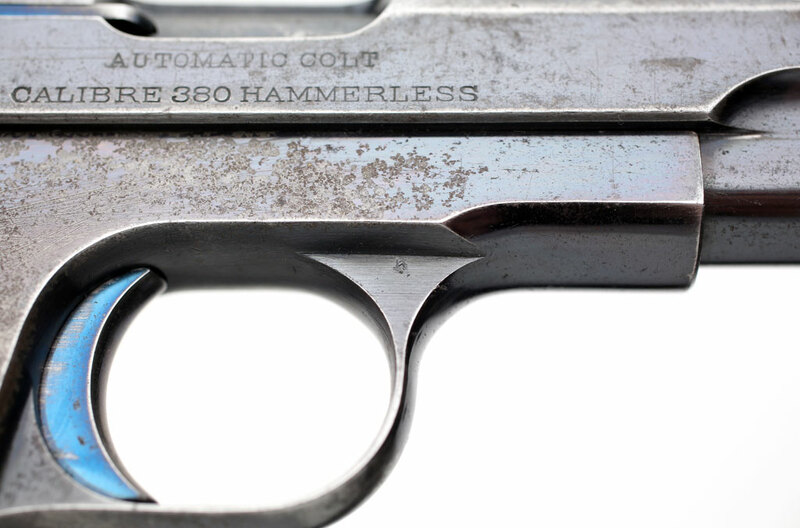 The highest number in contract run with integrated barrel bushing This police contract is the earliest contract on record at Colt for the .380 caliber Model M pistols. MPC is believed to be the Metropolitan Parks Commission (Boston PD). 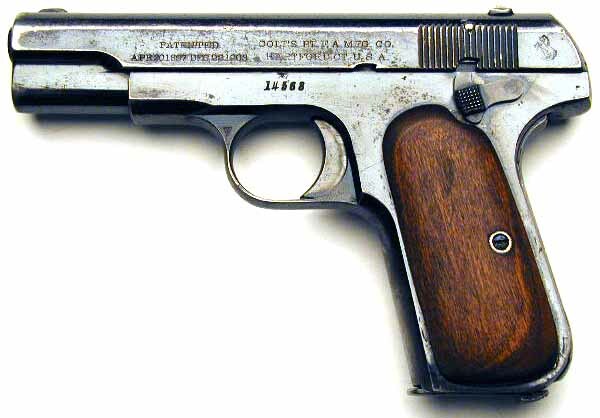 There were a total of 214 pistols sn 1328 - 14644 shipped 12/5/1908 - 6/4/1913. 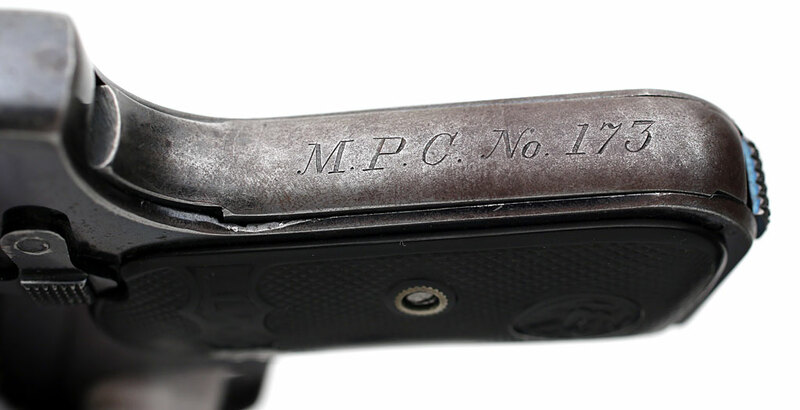 Model M .380 serial number 14578 factory inscribed "M.P.C. No. 214" on grip safety.